America, an immigrant country… America, thick with immigrant gods. What is America? And who are the gods who roam this country? Those are the questions raised by Neil Gaiman (himself an immigrant) in his iconic novel American Gods. This is Gaiman’s America: a sprawling landscape, larger than any one set of peoples or beliefs, where the land and nature are more powerful than any of the gods, old or new. This is not a novel about the world’s America, or Hollywood America. It’s not about glamorous/gritty New York City, or the quirky/tragic south, or golden California. Gaiman takes us to the smaller places – the airports and fast food joints, the motels in midwestern towns, the off-road tourist traps, and the second-city walk-ups. The premise: a war is brewing between the old gods and the new. A man named Shadow, an ex-con of mysterious origins with a faithless wife, is conscripted to join the battle by a huckster named Mr. Wednesday. Together they travel through the overlooked places of the country rounding up gods for a final battle to come. So, how did these minor deities (and not just deities, but leprechauns and elves) come to live their decreasingly powerful lives in the new world? As Gaiman deftly describes in chapter-length interludes, immigrants who come to America carry with them their beliefs in their old-world gods. These gods take physical form and live on. Only their power diminishes when people no longer believe in them. They linger, but largely without purpose, living quiet lives performing parlor tricks, a “shadow” of their former selves. The human Shadow of the book is clueless regarding all of this, almost to a fault. As a battle between the old gods and the new ones (gods of computers, media, etc) is joined, Shadow ambles along, more of a spectator than a vital player. For part of the book, he’s hidden away by Mr. Wednesday in an isolated midwestern town. At this point I was confused by this side trip. In the end we return to the town and we get to the heart of this subplot, but it kept me waiting and wondering why we’d even gone there in the first place. My problem with Shadow, as written, is that he’s often reacting, rather than acting. It’s a problem I struggle with in my own writing: if you have an ordinary man thrust in extraordinary situations, how do you have that character drive the action? In this way, Shadow is similar to Richard Mayhew, Gaiman’s hero in his novel Neverwhere. Gaiman’s huge talent, though, is his ability to create a sprawling, fantastic universe that captivates the reader regardless. There’s a world full of minor gods packed into these pages. Who are they? How do their personalities translate into their human forms? Would have enjoyed it more or less if I’d known something about these minor deities. There’s no glossary, and I’m unsure whether it would be revealing too much if there was. 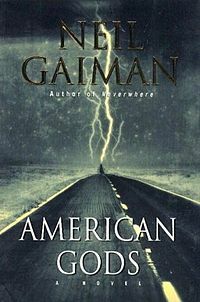 Nevertheless, Gaiman presents a thrilling take on America. The land itself is nearly a character in its own right. And as for the people and their fading gods, I wanted to keep reading, even when it ended.